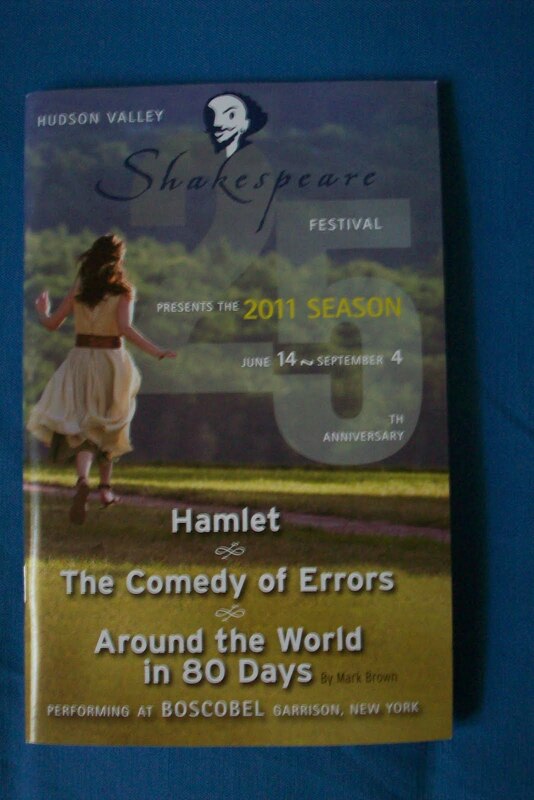 I finally made it to Boscobel's Hudson Valley Shakespeare Festival. They are celebrating their 25th anniversary and they are presenting Hamlet for the first time. Since I've never seen this famous play onstage, it was the perfect introduction to this popular Shakespeare company. It was a dark and stormy night the evening I went, but the show must go on, rain or shine under a huge tent. In this instance, the weather added to the macabre beauty and drama of the performance. What could be more chilling than the sight of an armor-clad King Hamlet's Ghost being restrained by Death, against the backdrop of the night sky with falling rain? And I cannot say enough about the eerie visual impact of the powerful ending. Shakespeare is daunting enough, but a three hour play even more so. But I hardly noticed the time. The entire company gave superb performances. The cast members are dressed in modern clothes, with rock music blaring---but not annoyingly so---during scene changes. Matthew Amendt's complex Prince Hamlet was a tour de force. The ill-fated Polonius was more nuanced, as played by Richard Ercole. Jason O'Connell's King Claudius was as creepy and deplorable as he should be. Other stand-outs include Ryan Quinn as the impetuous Laertes, and Wesley Mann as the gravedigger. Gabra Zackman's Queen Gertrude was timid and fearful. The rest of the cast includes Valeri Mudek as the tragic Ophelia, Stephen Paul Johnson as the Player King, and Michael Borrelli as the loyal Horatio. The festival runs until 04 September. I already have tickets to Around the World in 80 Days, and my review of The Comedy of Errors will be up soon.